What is one of the best ways to know if a particular college is a good fit for you? Visiting campus, of course! Visiting a college campus allows you to meet the people and get a sense of whether or not a school can be home. Seeing the classrooms, dorms, library, cafeteria, and recreation centers will give you an idea about what life is like on that campus and if you can see yourself there in the future. Perhaps the most important part of the campus visit is meeting the people. The faculty, staff, and students you meet on a campus visit are the people you could be around for the next four-plus years. When you’re on campus for a visit, there are two things you really need to know: first, there is no need to be nervous around these people, and second, you need to ask them really good questions that you can’t find the answers to on the college’s website. Don’t be nervous around college students. You might feel like they’re these cool college kids and you’re just in high school, but they were once in your shoes, visiting college campuses not that long ago. They are not that different from you, so be yourself and get to know them. Don’t be nervous around the faculty you meet either. Sure, they might be the ones who grade your tests and papers in the future, and they have advanced degrees…but generally faculty members teach college students because they enjoy mentoring young people and helping them grow into adults. Faculty want you to be at their school and in their classes, so don’t be afraid to interact with them. Now that you know to be yourself and interact with the people you meet on a college visit, the other important part is to ask good questions. This is your chance to get to know what the college is really like—there is only so much you can learn from a website, promotional materials and videos, or social media. So take advantage of your time on campus and ask the people you meet lots of questions. One of the first people you’ll probably interact with is a current student who is giving you a campus tour. 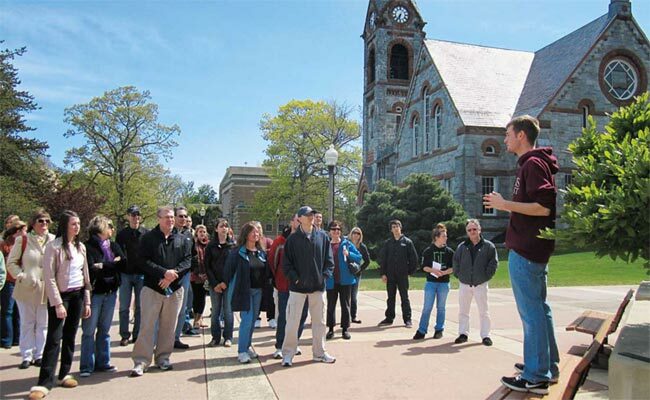 Most tours will show you around campus and point out main buildings and dorms, and they should provide you an opportunity to ask your tour guide questions. 1. What is your favorite thing about the college? Hopefully they’ll have a good answer for this one, or they probably shouldn’t be a tour guide. 2. What is your least favorite thing about the college? Here’s a secret for you: no place is perfect! If you expect perfection, you’ll always be disappointed. So ask the tour guide what their least favorite thing about the school is and why, and ask them for an honest answer. You should also ask if they could change one thing about their college, what would it be and why? Again, no place is perfect, so knowing some of the things a school can do better or differently up front is helpful. Another good question for your guide is who is one of their favorite professors, and why do they like them? You could ask them for an example of something really unique that professor has done to help them or make a lecture or assignment memorable. If you get a chance to interact with a faculty member in your field(s) of interest, there are several questions you need to ask them as well, like what a student can do to really excel in their class or in that particular major. This will give you an idea of the workload and expectations that faculty member has for their students. You could also ask the professor where have some of their former students done their graduate studies or where are their former students working now? Getting into grad school or getting a job in your chosen field of study is the main goal of college, and knowing where former students are now can help you see what your future might hold. I would also recommend asking a faculty member what kind of support is available at the college to help you be successful in your classes. After visiting with current students and faculty, you may also get a chance to visit with the admission and/or financial aid office. There are some good questions you can ask these people as well, but I would avoid asking them ones you can easily find the answers to on their website; hopefully you’ve already done a little research before visiting campus. Since you have a limited amount of time, make sure you know what you want to ask so you can get answers to those really important questions before your visit is over. I would recommend asking the admission office about the community surrounding the college. You’ll be living in that town for four or more years, so it’s helpful to know what is available to you off campus. You could also ask the admission office what building projects or new initiatives are on the table for the school. Knowing about new things or changes coming to the campus can help you learn how the college is advancing. There are lots more questions you could ask, of course. I would recommend you and your family talk about what is really important to you and go into your campus visit knowing what you’d like to ask so you don’t forget anything that is really important. Happy visiting!